Today, Azerbaijan celebrates the Earth or Last Tuesday (Torpag or Akhir Chershenbesi) prior to the main holiday to be held on March 20-21. The city's executive power has prepared a solemn ceremony with several entertaining programs. The event which started at 10:00 near the “Icherisheher” subway was remembered with a festive march caravan. The caravan composed of chaise and musicians was in the national spirit. 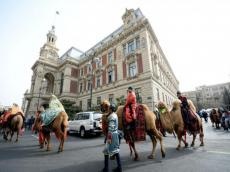 Attendance of riders in national dress, as well as camels and the main characters of Novruz attracted the attention of the public. Beloved Novruz characters- Kechel, Kosa ,Bahar gizi (Spring girl), as well as Dede Gorgud welcomes and congratulated Bakuians on the holiday. People in the Azadlig Square, in the park around the Crystal Fountain near the metro station "Koroglu” and in the Samad Vurgun park had the privilege to see the caravan as well. In the evening at 19:00 the biggest bonfire in the capital will be kindled near the "Gosha Gala". Novruz, which symbolizes the awakening, is one of Azerbaijan's most cherished holidays. Novruz has been celebrated by people from diverse ethnic communities and religious backgrounds for thousands of years. Some 17 countries including Azerbaijan, Kazakhstan, Iran, Uzbekistan, Afghanistan, Kyrgyzstan and other scattered populations in Central Asia mark this day as a holiday of the spring equinox. Novruz celebrations begin a month before the actual holiday. The four Tuesdays named after these elements and called Su Chershenbesi (Water Tuesday), Od Chershenbesi (Fire Tuesday), Hava Chershenbesi (Wind Tuesday) and Torpaq Chershenbesi (Earth or Last Tuesday).